We can create multiple copies of the same drawing with a simple Copy and Paste. Each copy thus created will be a separate drawing that takes its data from the same geometry field in the same table. Each drawing can be independently formatted using Style. Consider the boston_lines Drawing seen above as a layer in a map. 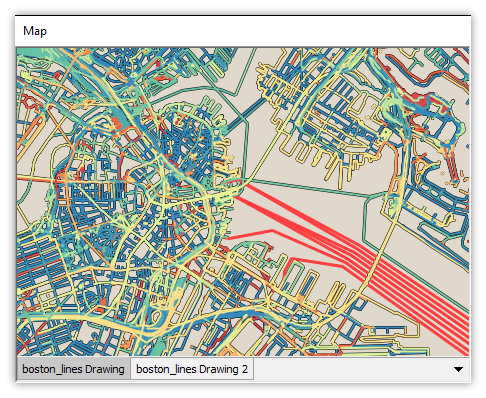 This drawing shows road lines in Boston that were imported from an OpenStreetMap (OSM) PBF format file. 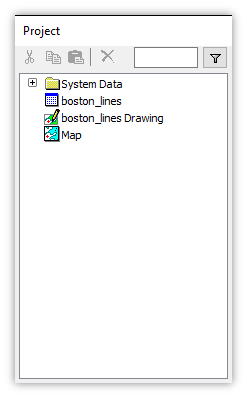 In the Project pane we can right-click on boston_lines Drawing and choose Properties to display the properties of the drawing. 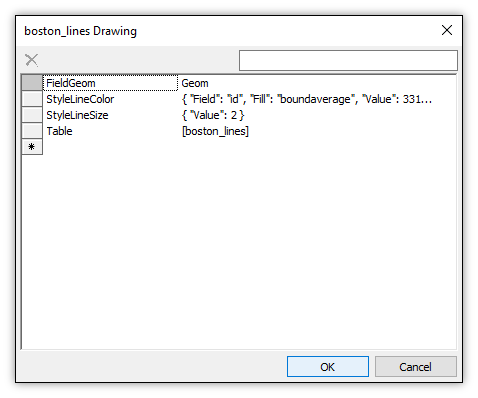 The boston_lines Drawing shows data in the boston_lines table using the Geom field for geometry. The properties also show the Style properties used for this drawing. 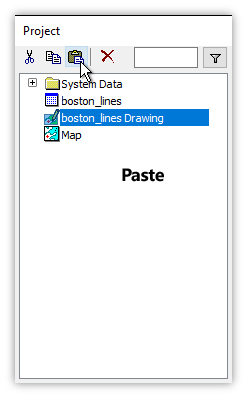 We click on boston_lines Drawing to highlight it and then we press the Copy button in the toolbar (or, if we prefer keyboard shortcuts we do a Ctrl-C for Copy). We then press the Paste button in the toolbar (or, we do a Ctrl-V for Paste). 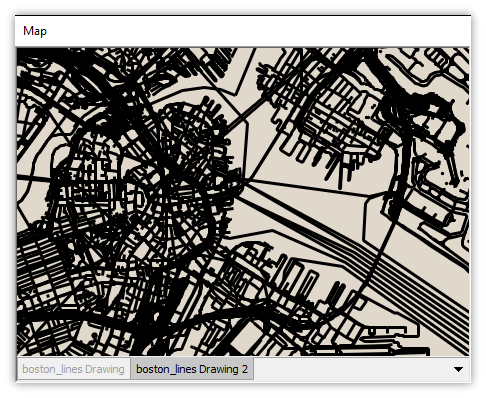 A copy of the boston_lines Drawing appears in the project using the name boston_lines Drawing 2. 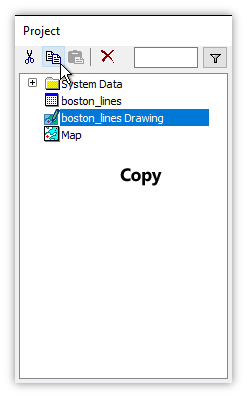 In the Project pane we can right-click on boston_lines Drawing 2 and choose Properties to display the properties of the new drawing. 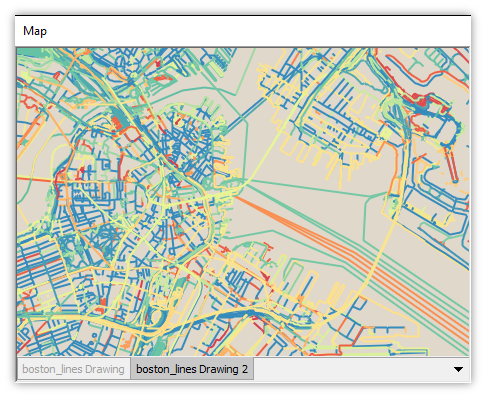 The boston_lines Drawing 2 also shows data in the boston_lines table using the Geom field for geometry. The Style properties are also identical to those of boston_lines Drawing as well. 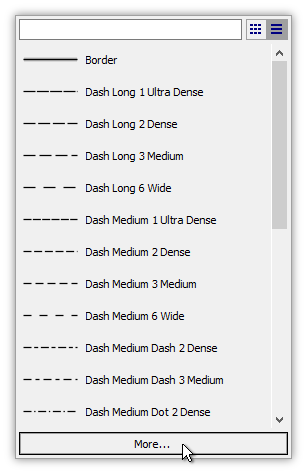 When we copy and paste a drawing we copy and paste all of the drawing's properties as well, including Style. We can drag and drop boston_lines Drawing 2 into the map, positioning the layer tab below that of the tab for boston_lines Drawing, and then we can double-click boston_lines Drawing to turn that layer off. That displays only the boston_lines Drawing 2 layer in the map. We can see it is an exact copy of boston_lines Drawing, no surprise since it shows exactly the same geometry from the same table using the same style. 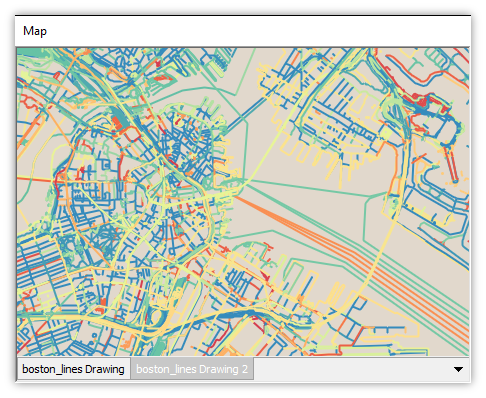 With the focus on the boston_lines Drawing 2 layer in the map we click the Style panel in the Contents pane. That allows us to change the Style for boston_lines Drawing 2. We click on the Color style property button for lines. That shows the thematic format that is in use. 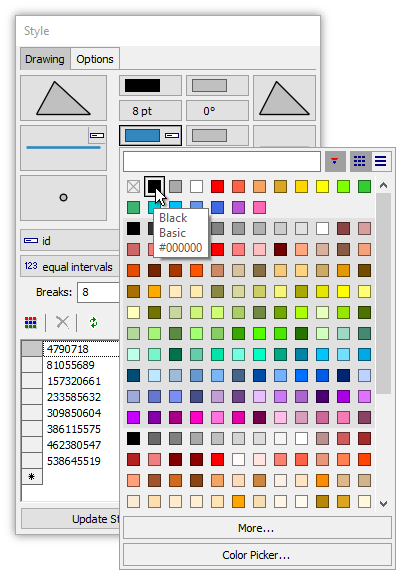 Instead of a thematic format using a palette, we will change the Color for lines to black color. Right away, the lines in boston_lines Drawing 2 change from various colors to black for all lines. Back in the Style panel we click on the Size style property for lines and change it from 2 to 3 points. Immediately the lines in boston_lines Drawing 2 become slightly thicker, using a width of 3 points instead of the former 2 points. Right-clicking in the Project pane on boston_lines Drawing 2 we display the properties for the drawing. 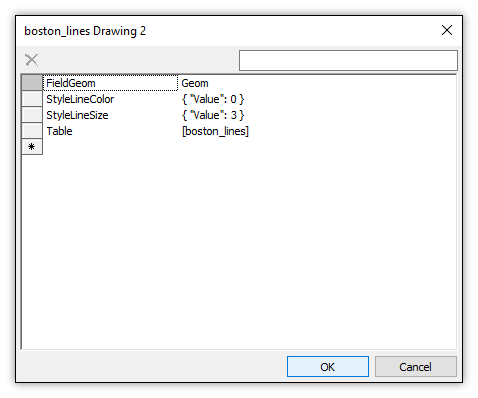 The boston_lines Drawing 2 still shows data in the boston_lines table using the Geom field for geometry, but now the Style properties are different than before. 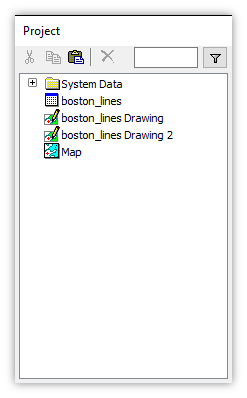 The drawing may have been created by copying and pasting boston_lines Drawing but now boston_lines Drawing 2 is a separate drawing that can be formatted differently from boston_lines Drawing. 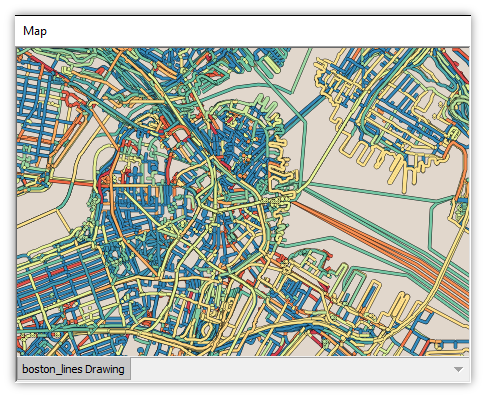 Back in the map, we double-click the boston_lines Drawing layer to turn it on. That shows the effect created by having the boston_lines Drawing 2 layer underneath that uses all black lines which are slightly thicker than the layer above. The visual effect adds black outlines to the edges of the boston_lines Drawing layer lines. All objects in both layers are perfectly aligned because identically the same geometry, from the same records in the same table, are used for both drawings. Only the styling is different. Turning off the lower layer we can see how adding black outlines provides a much better visual effect. When multiple drawings are created that use the same table all of those drawings share the same selection. 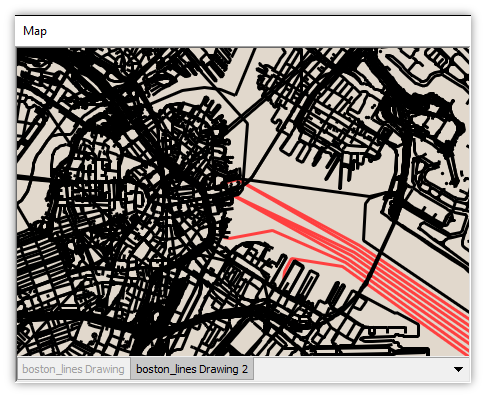 With the focus on boston_lines Drawing we select some lines, as seen above in red selection color. For clarity, we have turned off the lower layer. 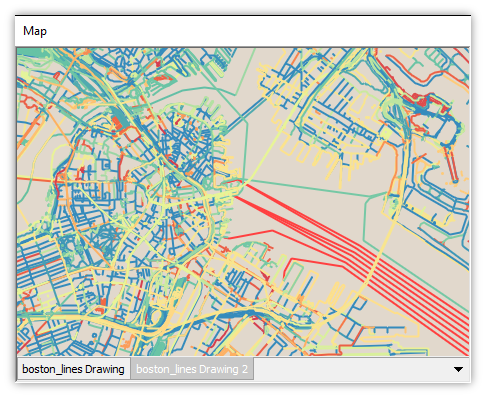 Turning off the upper layer and turning on the lower, boston_lines Drawing 2, layer, we see that identically the same lines have been selected in the boston_lines Drawing 2 layer as well. Turning on both layers we see that selecting lines in one layer automatically selects the same lines in the other layer, since both drawings show the same table. Important: Recent additions to the Style panel have made older workflow obsolete. This topic has been updated with new illustrations. However, there is no longer any need to build black outlines for lines by using multiple layers. 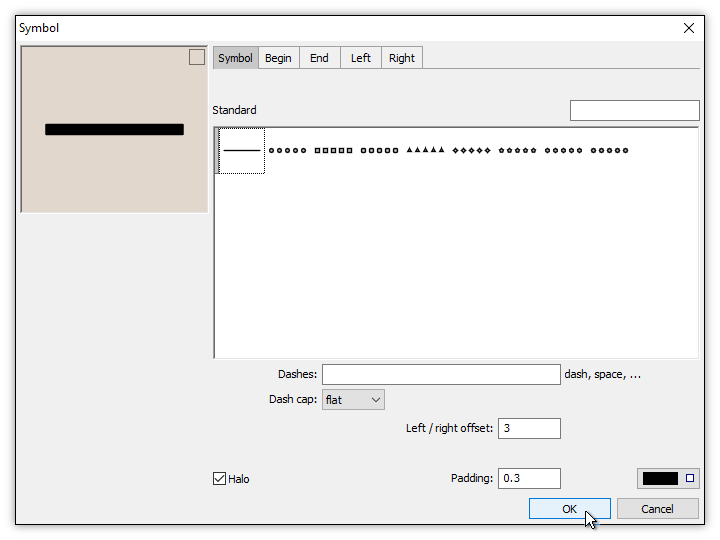 Instead, we can simply choose a black outline option for style symbology in the Symbol dialog. The techniques in this example are still useful for building complex line styles by "stacking" multiple layers. 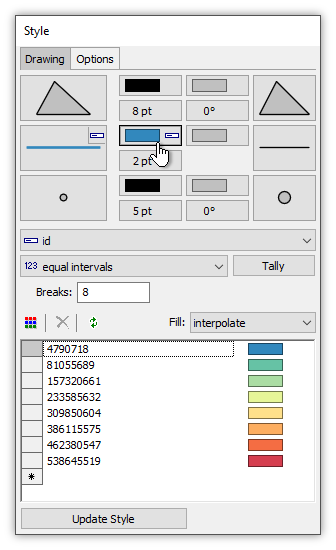 To achieve the same effect as seen above, black outlines for lines, we begin by clicking the Symbol button for lines. 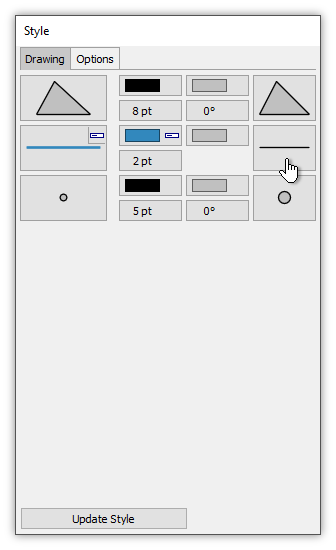 That launches a drop down menu with popular choices for symbol style for lines. We could choose the Border symbol option, but we know from experience that the Border option provides borders that are thicker than we like for lines of the displayed width. Instead, we choose the More... option to launch the full Symbol dialog. In the Symbol dialog we check the Halo option, we set black as the color to use, and we specify a Padding of only 0.3 points. That will result in thin black borders. We press OK. The result is a rendering of lines using black borders. The effect is more sophisticated than using multiple layers, since the bordering of lines is preserved where lines cross over other lines for a more realistic effect. Example: Two Drawings from the Same Table - Take a table with a geom field that is visualized by a drawing. Add a second geom field to the table and create an rtree index on that field so it can be visualized by a drawing. 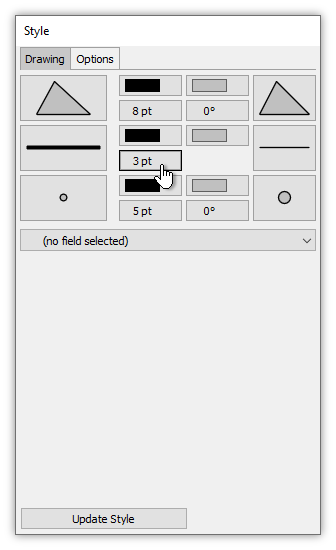 Copy the first drawing, paste it and adjust the pasted copy so it uses the second geom field. Demonstrate how to use the Transform panel to show "live" modifications in the second drawing compared to the first drawing.